The old shale tee pattern is now available for download. It’s a pattern designed to introduce lace knitting to beginning knitters looking for a new challenge. And it’s beautiful to boot! You might look at the pattern in the old shale tee and think it’s feather and fan. There is a difference. If you are from Scotland you know that old shale is the easy pattern shown here, involving yarnovers (yos) and k2tog stitches while feather and fan is much more difficult to knit with as much as k4tog. Check out this post which explains the difference between the two and has videos to get you on your way with this easy lace stitch. And, while we are at it: I’ve created a post with helpful tips for lace knitting generally. Later I plan to add a post on reading charts but for now this post includes a reference to a good post from Tin Can Knits. I’ve included three adult sizes for this pattern. 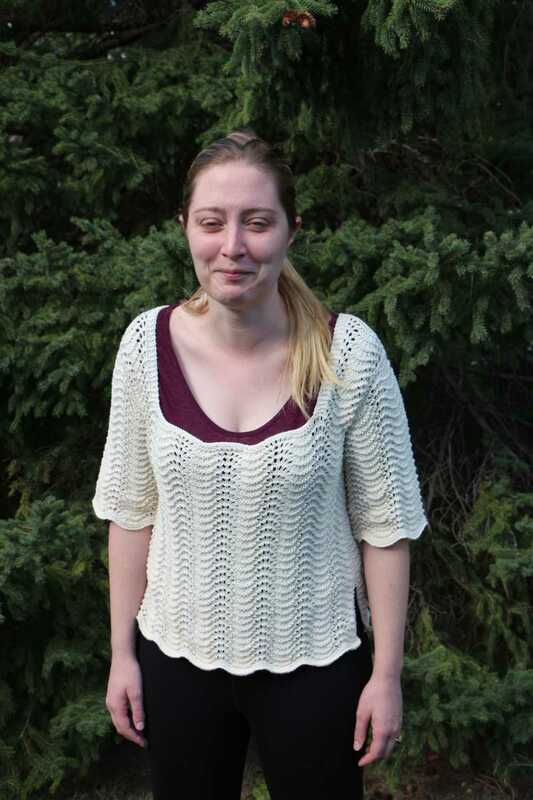 Old shale is a stretchy lace and this pattern is designed to fit close to the body. Side vents make it comfortable to wear. If you prefer a slightly different sizing, add two or three more garter stitches to the side edges of the main body and bind them off when you get to the underarm shaping. The general shape of all the pieces of this top are square, making for very simple shaping, again a good intro to lace. The sleeves are modified drop and slightly inset into the body. This adds to the close fit without adding difficulty. The neat thing about this pattern is that it doesn’t look square – the waves in the lace give the variation and the softer silhouette. To make my copy of the old shale tee pattern I used KnitPick’s Simply Organic Cotton ( sport weight in marshmallow, the only colour it comes in). Even though pure cotton is not elastic I found this to be a great yarn with which to work: soft and quite easy to knit. And, of course, with cotton the stitch definition is marvelous. You could choose to use any sportweight yarn or a DK if you fiddle with the needle sizes a bit. the magic of Shetland Lace Knitting illustrates the traditional knitting upon which I based the old shale tee pattern. Elizabeth Lovick has put together a really complete explanation of lace knitting from the basic stitches, yarns and needles to the stitch patterns that are traditionally found in lace knitting in the Shetland Islands. There are patterns for shawls, baby things and accessories but the concentration is on getting you to design your own by assembling the classic patterns into your own work of art. Elizabeth Lovick should be put on anyone’s list of go-to experts in knitting. 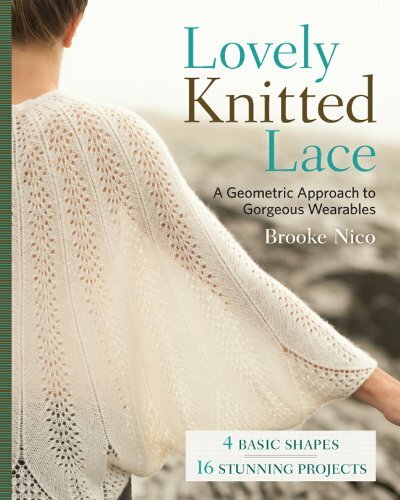 Brooke Nico’s Lovely Knitted Lace takes four basic shapes: triangle, rectangle, circle, square and turns each one into four different projects for shawls, scarves and other wearables. The introduction to lace knitting is less complete than the magic of Shetland Lace Knitting but the patterns are really well explained with words, diagrams and charts. Instructions come in both word and chart form. 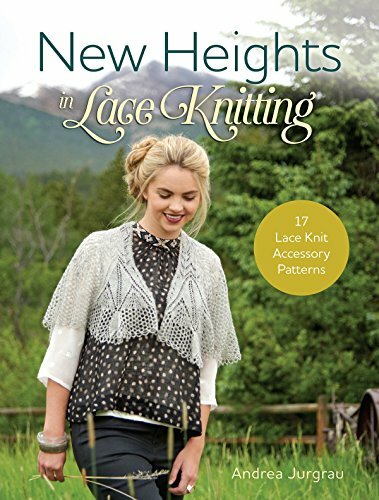 Finally I list New Heights in Lace Knitting by Andrea Jurgrau. 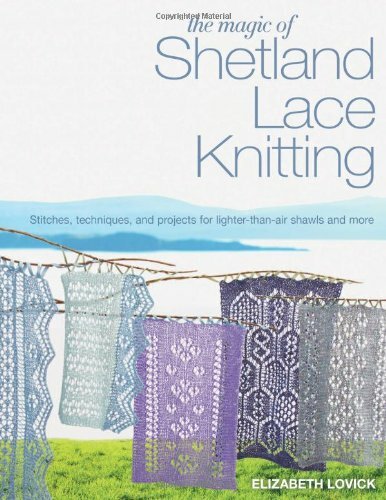 This is primarily a book of knitted accessories in lace with lots of great projects. Andrea starts out with some interesting sections well worth reading. There’s an excellent discussion of materials and tools. The section on techniques includes a variety of cast ons and bind offs you make not have used previously. Andrea assumes you will be using natural fibers and gives you a way of joining a new ball of yarn which leaves you with ends to work in and produces a much better visual result for transparent fine lace. And there is a complete chapter on swatching that is soooo worth reading. The pictures tell the story and will convince even a die hard that swatching (tension square knitting) is worth the effort even if it delays the start of a project. So there are my three favourite books for Lace Knitting. Do you have a favourite? Please share with us!